It's no news that most users complain of low iPhone battery life and are incpable to enjoy their phone in areas with little supply of electricity. iPhone X, latest iPhone smartphones is said to come with 2,716mAh battery capacity. 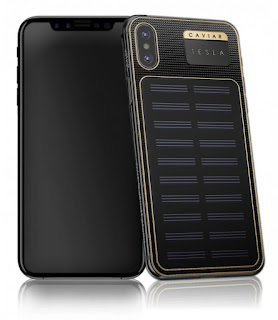 Thanks to The Russian company that manufactures customized iPhones with a golden plaque of Donald Trump and Vladimir Putin now launched the iPhone X Tesla with a solar panel on the back. According to the company, you just need to leave your phone laying on its face, and the back gathers sunlight to charge the device. The body also has PVD coating and shockproof plate. There is also a golden plate next to the camera setup because why not. The company directly replaces the glass body with a titanium one. It also has 24K gold rims around the back edges and the camera bump. Caviar said, you will need to have your phone screen laying down in order to to charge the device, it gathers sunlight rays and charges with the LED panel. The body as well has PVD coating and shockproof plate. A golden plate is also placed next to the camera setup. The luxury phone re-making company directly swaps the glass body with a titanium one. It comes with 24K gold rims around the back edges and the camera bump. According to Caviar, the self-charging iPhone X is inspired “by three great scientists Nikola Tesla, Steve Jobs and Elon Musk”, although I doubt if any of the above mentioned would imagine making such a device with questionable choice of fashion. iPhone X is expected to be launched tomorrow, and the Tesla variant release will be announced as well. The price tag of version with 64 GB storage is RUB259,000 or $4,445, while the 256 GB version draw out RUB274,000 or $4,700 from your purse.